N95-9210 Particulate Respirator Mask has 95% filtration efficiency against solid and liquid aerosols that do not contain oil. Mask folds down flat for easy storage. Why do you need particulate respirators? EMERGENCY APPLICATIONS - include dust, smoke and mold particulate protection following earthquakes, fires, tornados, hurricanes, etc. ALLERGY PROTECTION - This respirator is also a recommended effective and inexpensive solution for protection from breathing in the airborne allergens that often lead to sneezing and respiratory distress. OTHER NON-EMERGENCY APPLICATIONS - include grinding, sanding, sweeping, bagging and other dusty operations. 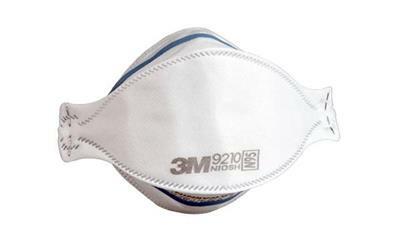 1 mask: 3.75" x 0.25" x 9.5"
Case (240/Case):19" x 10" x 17"
Disaster Usage: for use after earthquakes, hurricanes, tornados, tsunamis, winter storms, floods and any situation that causes airborne particulates. Soft cover web on inner panel feels comfortable against the skin. Soft conformable nose foam provides a custom fit and secure seal, reducing the potential for eye wear fogging. Electrostatically charged micro fibers of the advanced electret media help make breathing easier and cooler. Protects against dry particles and liquid or non-oil based particles from sprays that do not also emit harmful vapors. Individually packaged to protect against contamination during storage. NIOSH 42 CFR 84 classification of N95, (95% efficient, not resistant to oil). Fully open top and bottom panels, bending nosepiece around thumb at center of foam. Straps should separate when panels are opened. Make certain bottom panel is unfolded and completely opened. Place respirator on your face so that the foam rests on your nose and the bottom panel is open under chin. Hold the bottom panel securely under your chin. Pull the top strap over your head and position it high on the back of the head. Then pull the bottom strap over your head and position it around the neck and below the ears. Adjust for a comfortable fit by pulling top panel toward the bridge of the nose and bottom panel under chin. Place your fingertips from both hands at the top of the nosepiece. Using two hands, position and shape over the nose area by pushing inward while moving your fingertips down both sides mask.